You may be wondering why this recipe is titled a Dairy Free Chocolate Whipped Cream, Mousse or Icing recipe. Well first it’s gluten and dairy free because I use coconut milk and make sure all of the other ingredients fit the bill. Next when you make this recipe you can use it for either whipped cream, a mousse especially if you put it into the refrigerator after you make it or use it as icing on a cake, cupcake, brownie, donut, cake pop, cookie or anything else you want to top with icing. Obviously my favorite is my finger! This is a fast recipe to make but only if you do the set up. Everything MUST BE COLD. That means the bowl and beaters used to whip the coconut milk and the coconut milk itself. If you follow these simple directions then you will have Chocolate Whipped Cream, Mousse or Icing any time you want it. Yes I said anytime so be careful. But of course always keep 2 cans of coconut milk in your refrigerator just in case you need to whip up a batch. And once you get the hang of this I’m sure you’ll be playing around with flavors. Maybe you want to add in a different flavor like strawberry or even chocolate mint. Be creative and experiment. Please let me know what you create. Take a picture and send it to me and I’ll happily share it with your name on it. Now if you want the traditional Vanilla Whipped Cream, here is that recipe. Put your coconut milk in the refrigerator for at least 2 days and your bowl and beater for at least 1 hour. Open the cans of milk and carefully scoop out the solid coconut milk into your mixing bowl leaving the watery liquid behind in the can. Start your standing mixer on low speed. Once the coconut milk as started to spread out, add in the vanilla and sweetener. Once that is combined turn it on medium high and let it start to whip. Slow your mixer down again and add in the chocolate. Once the chocolate is combined turn the mixer up to high. If the cream is two thick you can always add in a little of the coconut water that was left in the can. It’s really just a matter of the consistency of your whipped cream. I’ve never had two batches use exactly the same amount of that water. Scrape the sides of the bowl as needed throughout this process and of course pick who gets to lick the beater and bowl! If you put this into a bowl and let it chill in the refrigerator for at least 1 hour it will have more of an icing or mousse consistency. This looks delicious, Diane! Rich, creamy and decadent. I just love using coconut milk as a base for ice cream, pudding, and icing. It tastes fabulous. And such a wonderful alternative to the traditional versions. I use a very similar recipe, however, I don't use the coconut water. What a great way to add some moisture in there. Thanks for posting such delicious recipes that are both gluten and dairy free. You make my life so much happier! I recently realized that I cannot eat gluten or dairy products and it's hard to find items that are free of both. I use your recipes every week now. The best thing is, these are recipes that my hubby can also enjoy! That looks so good! It would be such a fancy dessert for an Oscar party! Is there a particular brand of coconut milk that you recommend? Susan I've not tried too many brands so I really don't have one I like better than the rest. I've used Whole Foods and Native Forest and liked those. Just don't buy it in a carton as that will not have the cream separate out from the water. My mouth is watering. (seriously 🙂 I'll definitely make this. OMG! This looks amazing! I have been looking for a thick and creamy non-dairy whipped cream recipe for a while now. I Can't wait to try it! Thank you for sharing! I have a full basket of fresh strawberries….they would be perfect for dipping! 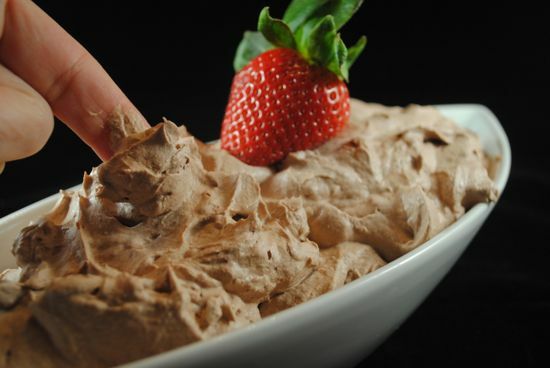 I'm going to make batch of this chocolate whip cream right now!! I couldn't get mine to work. It was Goya brand coconut milk (no fillers that I read on the ingredient list), and I whipped and whipped it, but it never did anything but make a mess. Sad face. What should I do differently? Oh no, I hate the sad face. OK let me ask a few questions. Did you leave the cans of milk in the refrigerator for 2 days so they were really cold? Did you put your beaters and bowl into the freezer at least 1 hour prior to whipping the milk? Did you leave out the watery part of the coconut milk and just put in the hardened cream and only add in a touch of the water as needed? I've not used the Goya brand so I'm not sure about the consistency of that coconut milk. Let me know if you did all of the above.